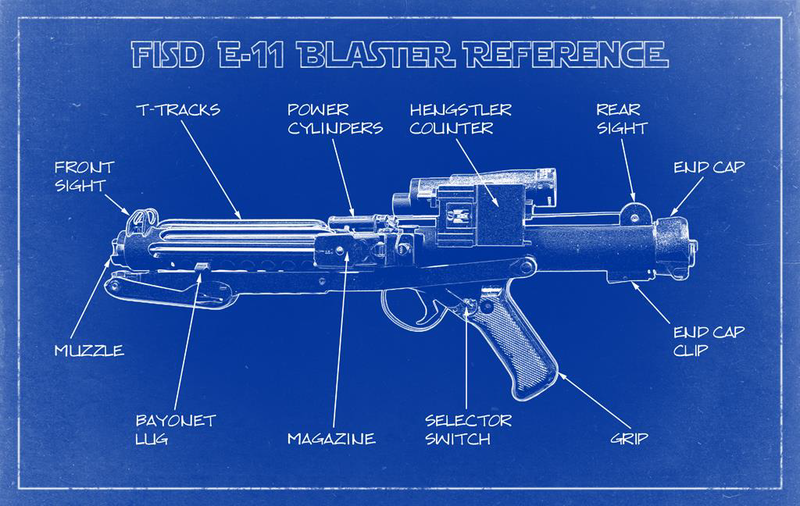 ... a small group of dedicated Star Wars fans and FISD members felt the time had finally come to create a one stop E-11 Blaster Build Reference. Working together from across the globe, the team collaborated online and worked hard to establish this collection of outstanding modifications to assist future E-11 builders. 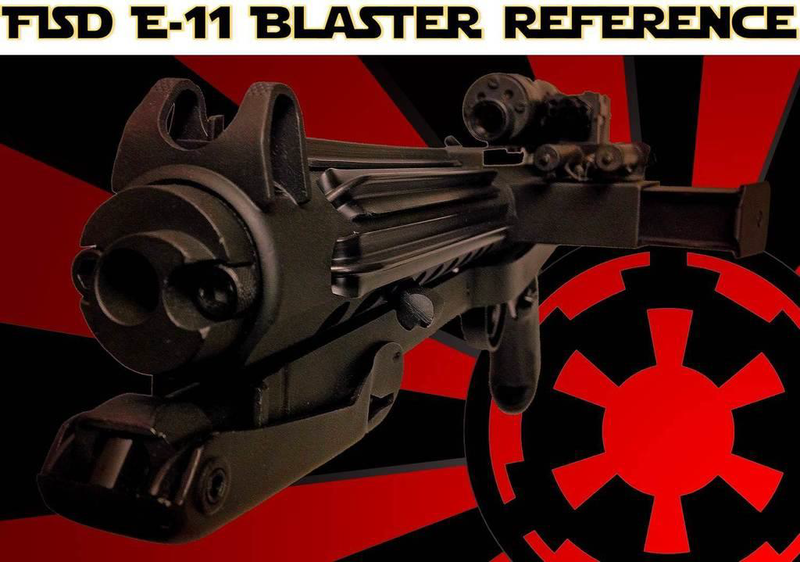 Designed for the popular and commonly used resin build kits, it includes modifications for the ANH version of the BlasTech E-11, however many of the modifications are usable in building both the ESB and ROTJ variants. All the content below will help you in selecting modifications for use in your own build, depending on your kit, skill level and personal preferences. Be aware to not use this document as a build guide! You always have to be sure about your next step. And we recommend to read the complete sub-section of a part before starting your work. To provide an overview, labelled blueprints are included, followed by an interactive table of contents to bring you straight to the relevant modification. Additional blueprints with even more detail are included in a separate chapter at the end. These really help to understand how a real Sterling works. After receiving your kit, conduct an inventory of all pieces and make sure everything is complete. Wash the resin parts with soap and water (like cleaning the dishes). This is recommended because the new parts will likely be covered with some fine resin dust and will still have release agent on the surface. Release agent is a chemical used to assist in removing the parts from the molds after casting. You want to remove all of the resin dust and release agent because they can cause problems with glue and paint. Washing all parts with soap and warm water will prepare the surface for your work. If a part is bent or warped (for example the arms of the folding stock) you can heat it up and carefully bring it to the correct shape. You must ensure that it maintains the proper shape while it cools down. To heat the part, you can use an oven or hot water bath for larger parts. Hair dryers or heat guns are ideal to warm up a specific spot of a part. How you heat the part depends on the part's size, and the temperature and time required to make the correction. If you use heat to alter a part, the most important ground rule is to start at a low temperature, and increase it until you are able to make the correction and not any higher. If you receive a broken part, you can fix it using super glue/CA glue. For additional support you might want to add one (or more) metal pins to the part during the repair process. A close inspection of your parts will surely reveal air bubbles (or tiny holes) in some parts. These and other defects can be filled up or removed by using modeling clay (like "Green Stuff" or "Bondo Cream"). One (or both) will be used during your build if you are doing any modifications anyway, so it is best to have it on hand. The major difference is the consistency of the two, as the Bondo product is (as the name says) a cream, while the "Green Stuff" is a 2-component modeling clay. When you start to make these repairs, consider whether the defect could be used in your weathering process to indicate some battle damage or wear if you alter it and paint it appropriately. Safety First: Whenever resin will be sanded, it is highly recommended to wear some form of respiratory protection, as resin dust is suspected to cause cancer. When running a "pipe build" (meaning you will have to drill all holes and make all openings to your receiver tube) please click here for accurate drilling templates in metric and imperial size. Be aware to follow the correct printing instructions and double check with the outer diameter of the pipe you will use. 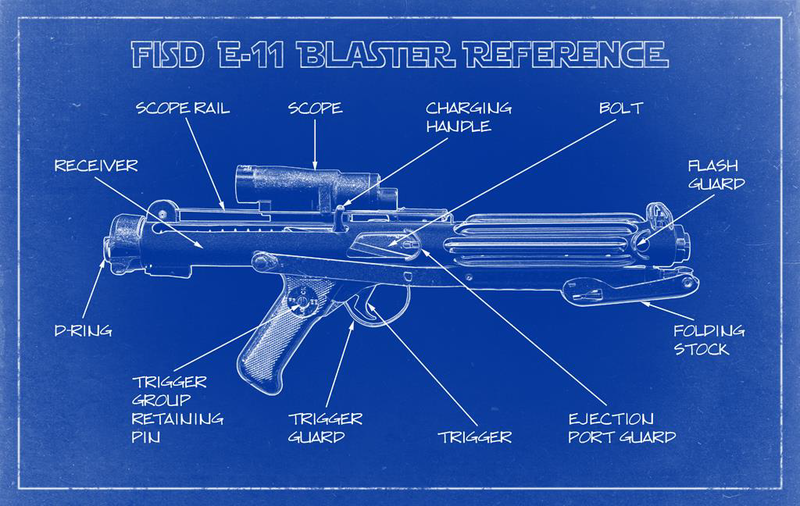 Mod A: Depending on your blaster kit, you might find some venting holes, being only implied. These can be drilled, beginning with smaller pre-drills. Do not forget the specially shaped hole for the locking mechanism of the folding stock. To provide more stability to full resin builds, the centre of the hinge (for the folding stock arms) should get drilled, to later receive some mounting screws. See last picture in next chapter. Better drill from both sides, instead of drilling straight through. The holes don't need to meet. Mod A: Replace resin screws with real screws. Select a drill bit just a little bit smaller than the new screw and drill a center hole. Then use an electric screwdriver to install the screw. The threading will cut into the resin and provide a tight fit. Do not force the screw into the material. If needed, pre-drill a slightly bigger hole. assembled blaster. Only gluing or applying epoxy to connect the grip may result in the top half of the blaster to break off. Attention: Do not place the grip next to the folding stock hinge. Leave a gap of about 4 mm. Mod C: With a hat nut you can replace another resin part in the grip. Be sure to close the small gaps around it with modelling clay. Mod A: A moveable trigger can be achieved with a simple nail and a spring from a ballpoint pen. Check original Sterling references for placement of the trigger and mark this position on your grip. Drill holes for spring and nail. Shape the trigger to fit into the slot. The trigger guards from real Sterlings were made from metal strips, bent to shape. Make sure to install your resin trigger guard the correct way. It will then also cover the head of the first support screw in the grip. Alternatively the guard can be made from a metal strip; aluminum being the easiest to form. Mod C: Some parts from the trigger group can be covered with very thin aluminum sheets, or you can completely recreate them. Mod A: The selector switch is at high risk to break off, so stablilization is mandatory. An installed nail, screw or 3.5mm stereo headphone jack works fine. If not glued, the part will remain moveable. the three switch positions on the grip. Once installed, openings can be sealed and disguised with modeling clay. Mod A: To recreate the visible part of the front sight pin, use a 2mm piece of plastic or metal and shape the top like the real part. Mod B: If you plan for very high accuracy on the whole front sight, the pin can also be completely scratch built from aluminum,a threaded rod or a long screw. Mod C: Depending on your kit and the accuracy you strive for, you might want to cut/separate the front sight block from the sight guard. Mod D: The original guard has a knurling pattern. This can be replicated onto your resin part using a thin layer of modelling clay. Before the modeling clay sets, simply imprint the knurling pattern on the guard in one careful pass. Check your tools for knurling patterns that you can use for this. Attention: this pattern does not cover the full surface of the guard but starts/ends different on the front and rear side! Refer to the photos below. Mod E: For some kits, you will now have to recreate the front sight block to sit onto the receiver tube and hold that pin. The pin can now be inserted and both sides of the block can be slotted like the original part. The small grub screw is inserted from the right side to hold the pin. receiver you are gluing it to. Mod B: Alternatively the guards can be scratch build from a sheet of plastic or metal (no pictures available). Check reference pictures and make sure to install your resin part the correct way. A metal pin or a screw from the inside will help keep the lug in place. When doing a pipe build, you will need T-tracks to cover the venting holes in the receiver tube. Although there are 8 rows with holes, you will only need 6 tracks at 7.5 inches in length. The bottom row and the row with the bayonet lug should not be covered. Tracks should get heated for easier bending with a heat gun or hot water (almost boiling). If the bends are angled a bit less than 90 degrees, this will help to keep the tracks in place. Additional support can be achieved with glue. You might have to shape the ends of your tracks to fit into the venting holes. Gloves are recommended for working with parts at high temperature. In case your kit comes with a folding stock made from 2 pieces, these must be joined together. Connecting the two parts with some support rods will add durability and ensure the parts remain in place while the glue/epoxy sets. The remaining gap will need to be filled and sanded to a smooth seamless finish before painting. Mod A: A commonly made mistake is to completely hollow the opening shown below. On real Sterlings you can still see a latch inside. It's position varies, as it is a moving part. If you hollow out too much, modeling clay can be used to recreate the visible part of the inner latch. Mod B: Depending on your blaster kit, you might find some holes on the bottom of the folding stock, sometimes only faintly indicated or appearing as shallow holes. These can be fully drilled through, beginning with smaller pre-drills. Mod C: To give the appearance of the inner rod in the foldling stock, an inlay from wood, plastic or metal can be installed after hollowing the appropriate section. When enough space is hollowed, this inlay can also be enhanced to the full length. In that case, the front section of your tube can be customized to perfectly match the real part. Mod D: Carving tools can be used to add more realism by carefully removing resin in between parts. This technique helps the components to appear separate from each other. Mod E: Resin rivets can be replaced with real parts (or something that looks real). Mod F: On real Sterling folding stocks where the Y-ends merge, you will find on the back end of the inner rod a small squarish block with the edges & corners rounded off. Here is where the hinge pin passes through. This part of the rod can be recreated from a solid block of plastic, wood or aluminum. Alternatively a small rod can be added through the sides of that part to simulate a hinge. Mod G: For a static locking mechanism you can use a simple screw head which securely locks the stock to the receiver tube. A countersunk screw will allow easier adjustment. Heat shrink tubing or insulation tape will cover the thread so it won't be seen later. Mod H: For more stability it makes sense to use screws when mounting the folding stock Y-ends to the receiver tube. Remove the resin blobs and drill all required holes. Openings in screw heads can be filled up with modelling clay before painting. Mod I: When using a folding stock from a real Sterling, the connection to the receiver tube depends on its material (full resin or pipe build). For a pipe build, the original parts have to be separated with a torch. To connect this to a pipe receiver use epoxy and a thick wire, going through the original part into the receiver. When it all cured, cut off the pins and sand to a smooth surface. The real foding stock can now be installed. For full resin builds, all parts need to be disassembled and an adaption part has to be built from scratch. Mod A: If your magazine is not accurate enough you can sand the edges of the top plate to be more rounded/soft and file the angles of the 4 outer corners (be aware of different angles at front and rear). Drill a hole and add a little 5mm knob (for example with a LED) and fill the magazine body (for example with foam). Also you can engrave the letters "OFF" and the arrow into the top plate (make sure your letters are upside down when the magazine is inserted and the arrow is pointing forward). Mod B: Another thing you can do is to completely replace the magazine with a more accurate version. In that case, you might have to deepen the opening of the magazine well to have the magazine insert at the correct depth. You may also have to thin down the inner walls on your magazine well to insert the higher quality resin casted magazines. Thinner walls make it more fragile so be careful not to break the resin here. Mod C: For a removable magazine, magnets can be installed and these can be hidden under a thin layer of modelling clay. Mod A: In case you replace the magazine with a more accurate one, it might not fit into the magazine well without thinning its inner resin walls. Use a rotary tool for this and be very careful to not break the thin walls! Choose if you want to leave the magazine in full length and completely hollow out the magazine well, or instead cut the bottom end of the magazine (which won't be seen later) to fit in the opening. Mod B: On top of your magazine well there might be some imprints and serial numbers, which are the same on all kits from that mold. You can change these for example to your individual 501st-ID. Just remove the current letters or numbers (with a rotary tool or electric screwdriver with drill or sand bit), fill the holes with modelling clay and use 4mm punch numbers to create new imprints before the clay cures. Alternatively you can engrave them. Bear in mind: adding power cylinders will cover most of this work later. Mod C: For a higher level of details, add some separate parts. Easiest is the set screw, which can be drilled and replaced with a real one (grub screw). On the underside of the magazine well is an oval inlay. Recreate this from a separate piece of metal, plastic or modeling clay and replace it for more realism. Mod D: When attaching the magazine well to the receiver, it is optimal to add some stabilization - especially for trooping purposes or if the magazine is heavy (massive resin block or filled with batteries). Depending on the inside of your magazine well, you can run 1 or 2 screws through the back into the receiver tube. If that space is required for something else, small metal pins will help (install like wooden dowels). The same should be done to support the round magazine catch screw located on top of the magazine well. make this even look like real weld beads. Mod E: The ejector in the mag well (long black part in first photo) can be fully recreated from scratch for even more realism. attach your inlay and the resin button to that rod. By pushing the button now, the inlay will move a little bit out of the magazine well. Mod G: To achieve a realistic magazine well, fill the rear side with modeling clay, remove the resin ejector and drill through it. A solid rod (aluminum or plastic, OD=8mm) can be shaped to match the real ejector. A diagonal cut on the end gives the required leftover, to recreate the „jet tail“ (add this later to avoid breaking it off). A hole of about 5mm should go through both, the ejector and the magazine well. Then drill a hole for the grub screw and cut threading on the inside. Do not forget to shape the ejector top end at 45 degrees. There should be two C-shaped guards in your kit. In case these are not the same size, use the bigger one for the ejection port. Please re-check chapter #10 and use these tips and tricks on the ejection port guard. Mod A: If your inner bolt is molded as part of the receiver tube (full resin builds), you can carve the outer area with a fine tool, making it look more like two separate parts. replace it with a 1mm strip of plastic. Use a heat gun to twist it and reduce (or fill) any gaps between the strip and the inner bolt. X00 0 000 000 X 0000 (the X stands for a letters and the 0 represents the digits). Hollow some space and fill it with modeling clay. Make new imprints while the clay is soft. Alternatively you can engrave them. Mod C: To simulate the extractor and plunger, carve these into the inner bolt or find and make some parts to insert there. Attention: Only a few early Sterlings had the "slotted" extractor as shown here. The majority had the solid extractor (without that slot). See also chapter #30, Blueprints: Bolt Detail and Bolt Parts. Mod D: The bolt can also be recreated using scratch parts and a thin aluminum sheet. The charging handle is always at high risk of breaking off, so stablilization is mandatory - especially for operational bolts. An installed screw works fine and after cutting the head off, it can be used to connect to the inner bolt. Be aware you can only reach some places while bolt and handle are not installed. Once these parts are installed, accessing some areas inside the receiver becomes limited or even impossible. Shape the charging handle to fit and slide through the long charging handle slot and leave a little gap at the very end as seen in the photo below. Study reference pictures about the rear end of the inner bolt and recreate this from scratch. Be aware the spring should later slip over this and still have enough room inside of the receiver tube. If you want to make a functional bolt, you will need a real spring going from the inner bolt to the end cap. Standard wires will only have minimal recoil effect, which is fine for static builds. Get a 1.8mm wire and find a pole or long cylindrical object with an adequate diameter to wrap this wire around (for example the thing from which you made the extended rear end of your inner bolt - in case this mod has been selected). Stretch the finished spring to have the same number of coils visible through the charging handle slot (when end cap is attached) like real Sterlings have. For trooping purpose, the rear sight can be reinforced with 1 or 2 metal pins (a good idea if your scope rail will be mounted to this). When adding it to the receiver tube, leave a little gap (about 2mm) to the raised end of the receiver tube (locking notch band). Check to ensure there is enough clearance for the end cap to move. The serrations must face to the rear of the blaster, not towards the scope (an often made mistake). Mod A: Drill a hole through the rear sight the same size as the inner hole. Cut a solid aluminium shaft slighlty longer than the length of the drill hole. With a dremel and metal drill bit (a size slightly smaller than that of the shaft), drill a shallow hole on each end of the shaft until it appears like a cup. Finely sand to remove sharp edges and polish to a finish. The outer ring can be fabricated with aluminium tubing or eyelet rivets. A larger opening on each end will need to be made to fit this but do not make the depth of this hole any deeper than the rear sight wall itself. Mod A: Drill that small bottom hole. Get an accurate metal ring (often called D-ring although it actually is 0-shaped). Modify the ring holder to fit over the ring. Fit it tight to avoid any rattling noise, or wrap some layers of insulation tape around the metal. Reinforce or replace the three locking notches to create more stabilization (otherwise the spring might blow off the end cap). Make sure the end cap lock is properly working and keep in mind that additional paint layers might later make this more complicated. Mod B: Carve a shallow recess into the end cap, the same size area as the ring retainer base. Once the desired depth to sink the retainer into the end cap is set, glue it into place and fill any seams with epoxy. Sand to a smooth finish. Mod A: Hollow the open side of the clip to make it more realistic. For trooping purpose, the end cap clip can be reinforced with 1 or 2 metal pins. Check reference pictures for final placement on the receiver and leave a little gap between the end cap. Mod B: A moveable end cap clip can be made with an aluminum U-channel. Cut the T-piece out of the resin version and fit this into the aluminum channel. Drill a hole at the correct position (see below) for the pivot pin. Measure and cut a metal pin. Make it sit flush with both sides of the channel. Mod A: Drill holes in the center of your resin scope's feet, to later mount it onto the scope rail. The hole in the rear foot will not be in the center! You can add one of the available E-11 scope target decals to the rear end and a circular cutout from a CD (compact disc) to the front end. Mod B: Alternatively you can drill straight into both scope ends with appropriate bits (for example spade bits) to install some lenses, made from glass or plastic. On the rear end of the scope, taper down the inner hole by using smaller/thinner bits when drilling deeper to later get a realistic internal view. 10mm is the visible diameter for the front lens, 22mm for the rear lens. Remember to paint the inside of the scope before gluing these in place. If carefully done, you can make both drill holes meet each other (creating an opening from one end to the other), enabling light to shine through the entire scope for added realism. Mod C: Additionally you can replace the 5 resin screws on the scope's front with real metal screws. At first you have to remove the resin screws (with your rotary tool) then drill small holes for the new screws and add these. receive the upgrade parts. The scope's main body needs to be hollowed all the way through and should be painted black on the inside before closing all joints. For even more realism, any matching kind of reticle lens can be added to this construction.